Distribution and habitat: Aspidistra elatior is a perennial which grows in wild up to 0.6m (2 feet) height and 0.45m (1.5 feet) width, native to islands in southern Japan. It is a forest plant and occurs in association with species such as Ardisia sieboldii and Castanopsis sieboldii. Description: Aspidistra elatior has dark green, leathery leaves 38-50cm (15-20 inch) long, which rise from a creeping rhizomatous rootstock lying half-buried in the potting mixture. The long, lance-shaped, glossy, dark green leaves grow directly from a number of short stalks. 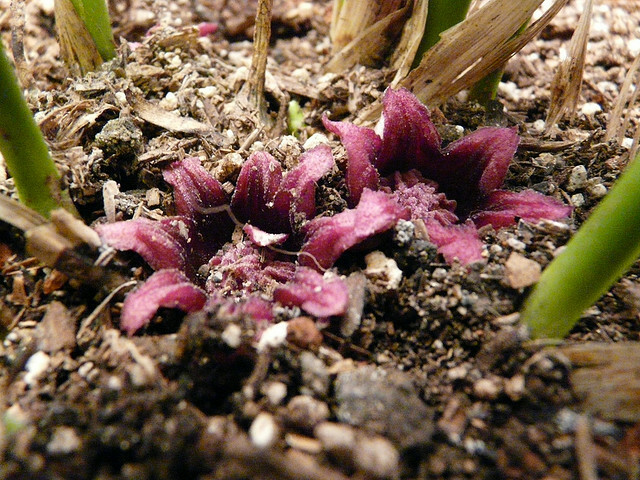 Inconspicuous, dull-purple flowers are produced at soil level, but these are often hidden by the foliage. Houseplant care: Aspidistra elatior can withstand poor condition and will survive where few other houseplants could; hence its name Cast-Iron Plant, bestowed in Victorian days when the introduction of gas lightning produced fumes that killed most other plants. It tolerates considerable neglect: tolerant of low light, low humidity, temperature fluctuation and irregular watering. An indoor Aspidistra elatior will, however, respond well to good care. The brilliant glossy green of Aspidistra elatior leaves can be maintained with occasional spraying or cleaning them with sponge using plain tepid water. Light: Although Aspidistra elatior may be kept in dark corners and other poorly lit positions, they will produce little growth there, whereas they thrive in medium light – for instance, at a sunless window. 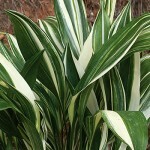 The variegated form needs brighter light to maintain leaf colour contrast, but keep the plant out of direct sun light. Strong light will fade the green colour of the foliage, except in winter when the plants appreciate a spell closer to the window. Also direct sunlight can scorch its leaves. Temperature: Aspidistra elatior is tolerant of wide range of temperatures, it will flourish equally well in either hot or cold rooms. Average to cool conditions are best suitable for Aspidistra elatior with a minimum of 7oC (45oF) in winter. Water: Aspidistra elatior need to be watered moderately throughout the year, enough to make the potting mixture barely moist. The top two-thirds of the potting mixture must be allowed to dry out completely before watering again. 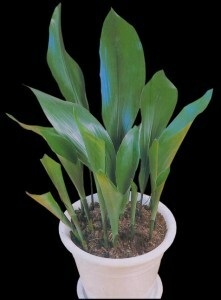 A common sign of overwatering in Aspidistra elatior is the appearance of unsightly brown marks on the surface of the leaves. Fertilising: Apply liquid fertiliser every two weeks during the active growth period to encourage development of new growth. Potting and repotting: Use a soil based potting mixture. Aspidistra elatior is a slow growing plant and will do best when left alone, needing repotting only at three or four years intervals. An overcrowded plant should be moved into a pot one size larger just as new growth begins in spring. Be sure there are plenty of clay pot fragments in the bottom of the pot for good drainage. Any plant that has reached maximum convinient pot size should be top-dressed with fresh potting mixture every spring. Gardening: Aspidistra elatior outdoors prefers a shady position in a rich well-drained soil. It tolerates poor soils and drought, though. These plants can withstand temperatures down to about -5°C (23°F) if they are well sited, being killed by frosts of -5 to -10 °C (23-14 °F) or below. Combine Aspidistra elatior with fine leaved blooming shrubs and perennials like Aquilegia species (Columbine), Fuchsia species (Fushcia), Illicium mexicanum (Mexican Anise-tree) and Campanula species (Bellflower) in a shady bed or woodland setting. Purple leaf Heuchera sanguinea (Coral Bells) and Mahonia aquifolium (Oregon Grape Holly) both add contrast and texture to the flat, green leaves of the Aspidistra elatior. 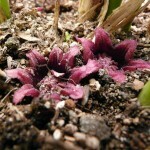 Propagation: Aspidistra elatior propagate by dividing overcrowded clumps in the spring. Each piece of rhizome should carry at least two leaves and several pieces may be planted together in one 10cm (4 inch) pot. Do not feed newly propagated plants; their roots should be encouraged to utilise nutrients founded in the new potting mixture. Otherwise, the needs of the new plants are those of the mature Aspidistra elatior. Regular feeding of liquid fertiliser can begin in the following spring just at the start of the growth period. Problems: Generally Aspidistra elatior is trouble-free when is positioned out of the sun and is not waterlogged. Avoid getting chemicals on the foliage. Do not use leaf-shine or other foliage cleaners. Tepid water will do the job of cleaning the foliage. Mites and scale may cause occasional problems. Outdoors, its leaves and roots may be subject to browsing by hoofed mammals such as deer, as well as rodents and rabbits. 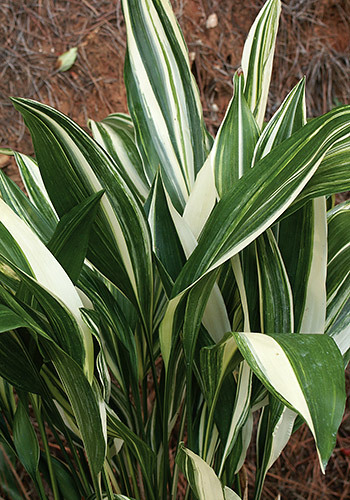 Aspidistra elatior ‘Variegata’ is an less common form of Aspidistra elatior; has white or cream coloured stripes of varying widths running the length of the leaves. Uses: Aspidistra elatior is the only species of this genus grown indoors, being suitable for container or above-ground planter as accent or edging plant. It is a handsome, large-leaved foliage plant, well known for its robust constitution. Aspidistras can be grown as a ground cover in a shady position by spreading to cover ground and out competing weeds under shrubs or trees. It grows within a woodland garden or in a shady edge. This sturdy, long lasting plant can be used in areas where all else fails; it is always green and can handle deep shade under deck stairs or along foundations that receive almost no sunlight.